It started out innocuously. We were waiting for a table at a restaurant, my daughter was about two years old and fidgeting. I checked the App Store on my iPhone for a kid genre, found a fake phone game, and let her go to town on it. It saved the day and bought us 20 min of quiet time. Since then I've downloaded a lot of games and educational apps for my daughter (who is now four and a half) and I've been meaning to write up the ones I think are worth a few bucks and have stood the test of time, and here they are. 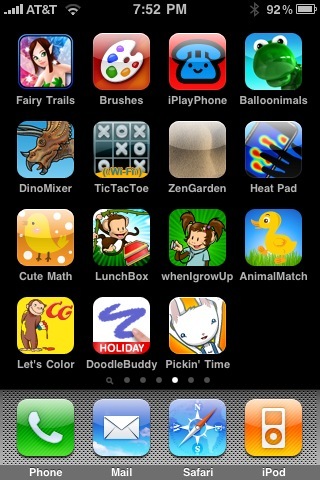 This is my "Kid Games" screen of my iPhone that I go to when I find myself somewhere with my daughter and we're both bored. This happens sporadically in doctors offices, in lines while running errands, and most often at a restaurant. I'll quickly recap each one here with an appropriate age range after. Fairy Trails — Augmented Reality for Kids! If you have a newer iPhone 3GS, this is a game that initializes the camera and you pan around the room, clicking the screen when you see a fairy fly by. It's pretty simple and kind of silly but can entertain kids for longer than you think (3-5 years). Brushes — fairly advanced drawing tools than can trip up younger users (by them accidentally zooming out or in), but for general drawing works pretty good (3-12+ years). I've tried dozens more and deleted them all when my daughter grew out of them or no longer found them interesting. These have stood the test of time and lasted several months to several years, and most are just a buck or so. Though I wouldn't suggest using these to ignore your kid or thinking that you just have to have them around all the time (crayons and paper are usually a bigger hit than an iPhone) these apps have come in handy when there's been dead time to fill and nothing to play with. Long after I quit using a Palm Pilot I kept one around loaded with games specifically for the kids. It can be a lifesaver when service is slow at a restaurant. Along the lines of iPlayPhone is BeBot, which is sort of like a finger synthesizer. There are some built in sounds, including Theremin, but it gives you the controls to mess with them all you like. My kids LOVE it and the crazy sounds it makes. I kept a hold of my original iPhone and have it loaded with applications for my 3 year old son. There is a healthy mix of silly games and educational apps. Some of the apps you mentioned above we have on there for him. He likes all of the 3Dal apps (Preschool Arcade, Preschool Music, and Preschool Adventure). He also really likes Little Cook and ABC Pocket Phonics. My kids loves Feed me! most recently. Also, Balloons (balloon popping game), Shape Builders and Unblock Me (a bit too advance to my 4 years old since an update though) has been their long time favorites. And all of them are free or has free version to try out. I work for this company and was responsible for the visual design of the Tickle Tap apps. Beyond that obvious bias, I think we have made some great games for preschoolers. My personal favourites are Sound Shaker which is a loose sound toy and Field Flier which is an exploration game. Awesome list! Thanks for the post. I have two wee ones and they both love Talking Carl. It’s a rather silly little app, but is sure to get a laugh out of them and keep them entertained. any chance you’d tell me what you think about Find Bruce? Thank you, Matt (and commenters). I’ve been looking for something like this for a while. My 3-yr-old has become obsessed with the iPhone, and I think he’s starting to get bored with his stable of ABC Animals, Koi Pond, Matching Zoo, Action Bowling, Traffic Rush, etc. He’s become such a videogame junky that we’ve had to limit his iPhone time to 15 minutes for every ten stars he earns by doing things like putting the dog dishes away, cleaning up his toys, listening, etc. My wife is considering purchasing some kind of dedicated “educational” kids videogame contraption like something by Leapfrog, but I’m trying to talk her out of it, assuming there’s gotta be plenty of educational games for the iPhone. So…are there? Geared toward a (very smart, of course) 3-yr-old? Try TowerSmash! Most of the supposedly kid-friendly apps still have little buttons sprinkled around that are too easy for kids to accidentally touch, and they bring up alerts or end the game or clear the screen or what not. I need to add my own experience. My two-year-old daughter loves playing with the iPhone and the Touch, and has plenty of videos saved in it for her. The anorak app is wonderful – a good selection for small children, simple and fun. I’ve been learning to program and illustrate at the same time and my result is Belindra! It’s an interactive, animated story with sound effects and a great narrator. Our 5 year old son can’t get enough of ifighter. It’s not really a “kid” game but for over a year it has allowed us to start going to restaurants again. Try Smack Talk… 4 different characters to talk to and they repeat back what is said. Reduce or increase the pitch and speed to change the output voice. My 3 and 5 yr old boys love it. We regularly use WeetWoo — safe Youtube for kids. You choose the age setting, and your kids choose the videos. The have thousands of videos, from education to fun shows. SmackTalk is great. I haven’t met a kid or adult who doesn’t like this one. Now I have to pry the phone from my 4-yr olds hand. “ABC Phonics Word Families” game is pretty good for my daughter. Easy enough for her to learn to read at an Early age. I second ABC Oddity, my 2 year old recognizes letters because of it. I also really like the Picpocket books, we have round is a mooncake and cucumber soup. They’re like little audio/visual books on your phone. Really cute and engaging. My kids really like earning pocket money and setting up chores/rewards using the ChoreBank app. Crazy Frogzy – tapping the frog makes him jump to catch flies. He’s supposed to catch only flies but my 3-yr old thinks it’s hilarious when the frog screams after catching a bee instead. Shape Builder – this game is a simple drag & drop puzzle game, but has so many different shapes to put together it’s stood the test of time for my boys. Animal Mechanicals Memory Match – my 3-year old is also big into matching. There are probably better ones, but this one is free. My 16-month-old loves two similar games: Bubbles, which lets you create and pop bubbles that fall down the screen, and Brian Eno’s Bloom, which lets you touch the screen to create floating circles and soothing tones. Thanks for the list of apps; I’ll be checking some of them out for my two-year-old. AniMatch is a *great* one, simple memory game. My 2 yr old daughter (now 3) started solving it in < 90 seconds which is faster than a lot of adults [proud dad syndrome, sorry] but it's got great replay value. The animal noises drew her in and she still loves it. Creator of iPlayPhone here. Thanks for the link love! Maybe you can give “Cooking Quest”, http://www.apple.com/downloads/macosx/games/cards_puzzle/cookingquest.html, a try. My 2 years old loves it. Very good vocabulary building. The cooking at the end of each stage teaches sequential and time management. ShapeBuilder, iWriteWords, Planets, Seuss ABC are on educational side as well. Hope your little one loves them. My two years old loves your app. He’s learned many new words from it. Great work! Thanks. I agree with you, Liz, that Picpocket books are great. I like Cucumber Soup. (I didn’t get Round is a Mooncake because I have a copy of the book.) Have you tried Seuss ABC? Greater than I expected. Cheers.